The much-anticipated Osun gubernatorial election is due for Saturday, this weekend. The surprise thing that draw attention to the state are twofold. One, for the first time in the history of Nigeria’s elections, 48 candidates are contesting for just one seat of the governor which the incumbent governor Rauf Aregbesola is about to vacate come November 27, 2018. Secondly, among the aspirants contesting for the same seat, one can see the serious, the pretenders and the jesters. So, for political analyst, it will be an easy task to know who is the best man for the job. It is good to know that the job of a governor is not just for anybody but for those who knows the nitty-gritty of governance and has sound knowledge of economic process. In our nation anybody can become a commissioner but not for governorship. This is due to the fact that the buck stop at the table of the governor. In a Presidential system of government, the success and failure of administration lies on the shoulder of the governor. Woe betide a state that has a governor that does not know why he was voted into office or cannot think outside the box. If ever the said person has not given it a thought that the purpose of governance is to ensure the guarantee of security of lives and properties and to hold the entire state together as his constituency then such state is in trouble. Gboyega Oyetola of All Progressive Congress (APC) stand tall far above other contestants in term of experience in boardroom politics and private sector economic management. Having spent 30 years in the banking, finance, insurance, real estate and oil business, none of his opponents comes close. Not only that he has enjoyed the privilege of working with one of the best governors in Nigeria and has been part of the catalyst that turned Osun into a modern state. In term of education, he is a learned fellow that has studied both in Nigeria and abroad. He holds degrees including Masters In Business Administration (MBA) from the University of Lagos. Oyetola shared the vision of the outgoing governor in all the six Integral plans that has succeeded in wiping away hunger, poverty, ignorance and provides good and affordable healthcare. This also includes wealth creation through provision for the need of the youths called Osun Youths Empowerment Schemes (OYES), a scheme that has been recommended by the World Banks to other states and currently been run by states and the Federal Government. His articulation of facts and issue raised at the Channel Television organised for the aspirants for the September 22 election was a signpost to the electoral victory that is coming up this weekend. His superlative performance at the debate made him to be far and above other contestants. It is not a matter of pride but popularly held view in the state that you cannot work with Aregbesola for eight years without his vision and sagacity rubbing off on you positively. If under eight years, a man of Oyetola’s calibre could work with the governor without stain or accused of materials accumulation and no single person has accused him of theft or money laundering, then he is good for the post of governor. While other contestants were more of green horns, Oyetola was in January 2018 awarded the best Chief of Staff in Nigeria by the Guardian Newspapers. One of the qualities of a good leader is to be a good team-leader. This feature catapult him to the top of the job he is seeking for. He has been a man that carries other executive members along. On the ability to turn the economy around, he has the carriage and experience he has acquired both in the private and public sectors. Despite the economy downturn in Nigeria, Osun is rated next to Lagos in terms of economic growth. It has the least poverty rate in Nigeria. 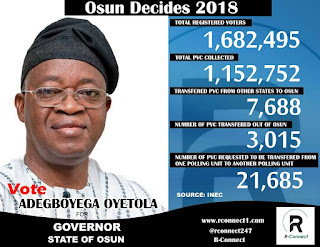 The campaign slogan of Oyetola is Continuity. He is capable of continuing the good works of Rauf Aregbesola in the revolution brought to Osun education. Continuity in infrastructures and rural development. Continuity in the health with the construction of new hospitals and renovation of old existing ones in all the local government areas. Oyetola understands the challenge of paucity of funds the state and has promised to use his experience to improve the Internally Generated Revenue without bringing any inconvenience to the citizens of the state. Those who are jittery over his capability to continue where Aregbesola stops, and with their shenanigans, used derogatory remark of "ajele" to describe Osun indigenes who have returned home to help the state, they will soon realise that their cat cannot fly, as the various groups and interest are now backing him for the job, knowing fully well that the change Aregbesola brought to the state is too good to be lost to the hands of jolly-go-fellows who for seven years could not point to specific achievements. The Osun people will not want a backward journey to Egypt after eight years of good governance in which Oyetola was part and parcel of. Without doubt the best man for the office of the governor is no one else but Gboyega Oyetola. Fortunately, Oyetola hails from Iragbiji in Osun Central that has the highest number of voters in the state. Not only that, it is one of the Senatorial Districts that enjoyed highest numbers of projects in terms of infrastructural development and high numbers of newly constructed schools and hospitals. This is likely to be a positive payback time in term of votes for the administration of Rauf Aregbesola that has changed the face and beauty of Osogbo, the state capital. Obaditan, a journalist and an attorney, lives in Osogbo.